The Eurozone last week pushed Greece to accept more austerity in exchange for a loan of 7.5 billion euros to pay off the country’s debt. This comes less than a year after Greece was promised debt relief following a bailout worth 86 billion euros last summer. No debt relief deal is in sight, however. Even the IMF, normally a keen proponent of balanced budgets, argued austerity was only making matters worse in Greece. But the Eurozone, led by Germany and the Netherlands, rejected any notion of debt relief until after the German elections in 2017. Debt relief might therefore come at the earliest in 2018, and may only amount to lower interest rates and extensions on payment deadlines, if it comes at all. Ordinary Greeks are reeling under the impact of these policies. Unemployment stands at almost a quarter of the population. In a further restriction of Greek sovereignty, the agency for collecting taxes is to become autonomous from the state and its head is to be agreed with the lenders. Despite all this, the policies pursued by the Eurozone, and accepted by the Greek elites, are not solving the debt crisis. The country still owes 180 percent of its GDP, making its economic system as it stands dependent on injections of cash from the creditors. 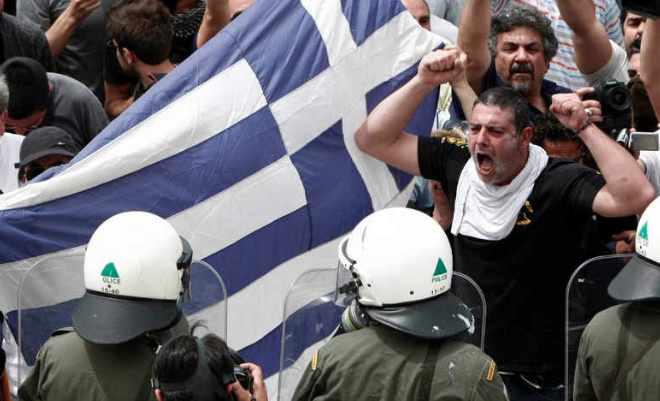 Why is the Eurozone punishing Greece? So why are the creditors pushing for policies that are apparently not working? To some extent, these policies continue because they enrich the creditors. Greece faces more privatisation of its banks, ports, airports and coastlines. Many of these will be going to the creditors. The hope is that Greece will survive until 2018 and then its economy will be allowed to grow again, once its economy has been sold off to creditor companies. But this is only partly why the creditors are pursuing such humiliating terms on Greece. The other part is political. The creditors want to make sure no debtor in the Eurozone dares to defy the rules again. They want to punish Syriza for having dared to challenge it in recent years. Indeed, just in March, ‘Wikileaks’ revealed that the IMF was concerned with the Eurozone’s hard approach, which it believed could provoke Greek resistance, a Brexit and the surge for the left in the June elections in Spain. The Eurozone ministers, however, defied the IMF, which also holds a slice of Greek debt. They appear confident that they can force a total neoliberal transformation of Greece. Even better, they think they can do it with an apparently hard left party in power in Greece. This humiliation seeks to de-legitimise the left across the continent as workers face attacks on social standards and democratic rights. Looking back to last summer, the creditors and the Greek elites managed to ignore the overwhelming Greek ‘no’ vote in the referendum rejecting the terms of the bailout. Their response to the claim that they were trampling over democracy was to state that democratic decisions in the other member-states of the EU trumped the democratic will of just one country: Greece. This is what lies at the heart of the project of ‘European Union’. The power of capital is such that no nation-state is allowed to resist the neoliberal transformation of country after country, by use of the debt crisis to privatise entire economies. Greece under Syriza tried and failed to resist. Central to any progressive attempt to re-fashion politics in favour of ordinary people needs to be a willingness to break with the EU – because it is unlikely any left government will be allowed to wait for other left governments to take power to aid it in the struggle to transform the EU. Rather, it will be faced with project fear, real blockades and other forms of destabilisation, including the threat of coup from within, unless it capitulates. Of course the left across the continent should cooperate against such blatant blackmail. But the truth is that a new Europe cannot be built by selectively dismantling or totally reforming the existing institutions of the European Union. This can only be done by unmaking them. In the concrete context of the struggle against neoliberalism in each country, the left needs to take the conditions in its own country as the starting point of its strategy for the fightback. It cannot be otherwise: the left can only directly affect what happens in its own country. In the UK, that means voting to break with the EU. This will not be an automatic victory for the right wing Tories. It will mean crisis for the elites in the UK. Precisely because the UK economy is so deeply embedded in the EU economy, a large section of the British establishment and a majority of the parliamentary Tory party is against Brexit. They will not wish to deal with the re-opening of the Scottish question either, as Brexit is likely to reignite calls for Scottish independence. Brexit will also lessen the legitimacy of the EU in its attempts to force workers in countries like Greece to heel and it will weaken the ability of European countries to intervene military abroad, as the EU will be a lesser power and will continue to splinter. The left ought to be pleased with the weakening of imperialist power globally. All in all, the social and democratic rights granted by the EU are being progressively whittled away as it increasingly becomes a fortress of capital. The best way to resist is to divide our enemies but unite in struggles across the continent – from below. A victory for workers in any country will serve as a beacon for others. And let us not forget: international demonstrations against capitalist globalisation and imperialist war in the 2000s did not rely on visa-free travel and Ryanair. They came from the realisation that another world is possible. This should be our guiding spirit today. This article originally appeared in Counterfire.